And so, forty years to the day Wendy and Richard Pini’s fantastical elves entered our world, their quest comes to an end. Is it a good one? Yes, though certainly not the easiest. Fans of ElfQuest are many and varied, though reading through a random sampling of letters in the back of any issue reveals some common threads. Lots of readers, myself included, discovered the Wolfriders and Sun Folk, et. al. as young people navigating the tender ages of identity-making and self-discovery. As much as the elves were moving ever forward in their quest to reunite all lost tribes of their kind in the World of Two Moons, plenty of pages were devoted to their philosophies on life, love, and family – both genetic and chosen. The elves themselves were so varied, even within just the core groups of the Wolfriders and Sun Folk, that readers everywhere had someone to graft onto. More likely, a few someones. For those readers who were teenagers at the time they discovered the story, the tribe’s musings on and contemplations of existence acted a bit like Skywise’s Lodestone, pointing a way towards “true north,” whatever that meant for each of us. 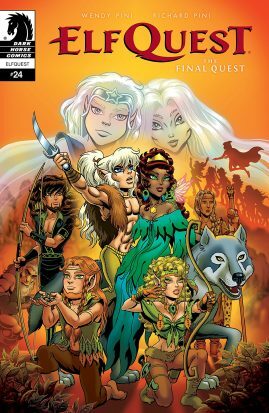 For me, I found ElfQuest to be particularly adept at presenting the Jungian concept of the anima and animus, with soulmates Leetah and Cutter together acting as a feminine and masculine half of a whole being. Between the two of them, I frequently saw my own reflection, and in their long-lasting balancing effect on one another, I learned to recognize the particular balance of the dualities in myself. Later, during these last issues of The Final Quest, the anima/animus aspect came into play again when it was revealed that alpha-wolf Cutter shares half his soul with the ethereally feminine High One Timmain. While this development left a whole lot of readers’ heads spinning, I could hardly contain my delight. In addition to voraciously devouring every collected volume of ElfQuest my library had on hand, I also went on a big Carl Jung kick when I was a teenager. I always assumed my interpretation of EQ’s main couple was inextricably wrapped up in these pubescent obsessions intertwining – and, of course, it was – but how exciting to read through Wendy Pini’s long-planned ending as an adult and find that maybe I really was on to something! 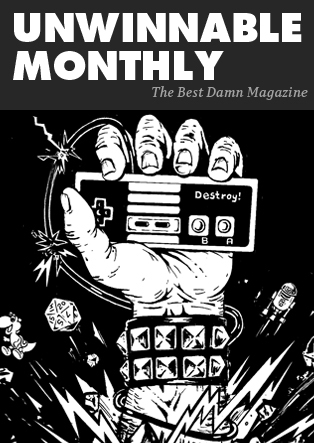 But enough about me – since the final issue releases today I’m taking great pains to avoid anything and everything spoilery, so hopefully you’ll forgive the digression. Going back to all those letters columns, though, it seems it’s difficult to completely separate the personal when reading ElfQuest. As the tribe evolves and changes, so do we. We’ve known them so long they seem like family, and like any family they offer lessons on life and living, on the best ways to join together and part, on the seeking of reasons to say hello and the necessity of eventually saying goodbye. Farewell, my friends. Shade and sweet water. In 2012 the world lost an incredible artist. Jean Giraud, the French artist who worked under multiple pen names like Gir and most famously Moebius, was an artistic force whose legacy is still playing out over here in the U.S., as people here are discovering everything that he was involved with creatively. This delay seems to be a combination of him not playing well with others, and being habitually ripped off and not compensated. It’s undeniable that numerous memorable visuals and ideas in pop culture would not exist were it not for him, and they are found in films like The Fifth Element, Alien, Empire Strikes Back, The Abyss, Heavy Metal, Time Masters and many more. Check out the numerous books he worked on like Silver Surfer: Parable, Arzach, Airtight Garage, L’Incal and Edena. Watch Jodorowsky’s Dune, a fantastic documentary about Giraud and frequent collaborator Alejandro Jodorowsky’s failed attempt to make the first film adaptation of Dune, the storyboards and concept art inspiring the next 30 years of science fiction and fantasy movies. Then check out this collection, because there’s a lot of crazy stuff swirling around inside the head of Moebius, and you’ll need all the help you can get figuring it out. This is a wonderful collection put out by Dark Horse, the company responsible for publishing a collection of Arzach stories that was my first exposure to the world of Moebius back in high school. My perception of what comics were capable of changed from that day forth. I’ve read many more Moebius books since then, and to come around to this story puts many of these stories and characters into perspective, as well as framing Jean Giraud in a personal light that I’ve only briefly encountered before in his work. In her great introduction Giraud’s wife Isabelle gives us a frame of reference as to where he was at this time. Giraud casts himself as the main character, an older balding man wandering a landscape he refers to as Desert B. According to the excellent accompanying notes in the back of the book written by translator Diana Schultz, Desert B is a pun on a French word meaning “to weed” (désherber). We learn in his narration that he is trying to quit smoking weed, which has become more of a crutch and an addiction than an inspiration in his early 60s. We also earn that it’s around late 2001/early 2002, and 9/11 has had a profound effect on him that he still can’t fully process. Over the course of these first two chapters (there will be six published in English ultimately) Giraud encounters many of his creations, and a terrible person from our world appears as well. There isn’t so much of a plot as there is a series of events playing out across the desert. The final chapter of Inside Moebius was the final new thing created by Jean Giraud before he died, and this is the first time that this project has been translated in English. It’s a fascinating statement from a legend in the comic book and science fiction/fantasy world. It’s not something to jump into casually without some knowledge of Giraud’s work. Even then the book is a strange freestyle, Giraud riffing on many topics sometimes simultaneously. 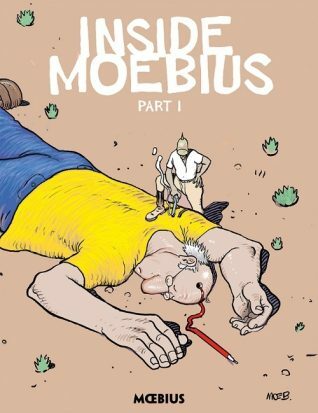 As readers we are given a glimpse inside Moebius, as the artist contemplates life and death, creation and destruction while coming to grips with going clean and overcoming his addiction. The artwork is loose and cartoony for the most part, which works well in representing the chaotic state that Giraud seems to be in. There are moments of the tight linework and crisp detail Giraud is known for, but his artistic approach is different with this project. His expansive background landscapes are still present though, plain but still beautifully weird in this case. The portions of this book that resonated with me most were Giraud’s passages early on where he is working through overcoming his addiction and reliance on marijuana. In the years since I’ve quit smoking I’ve had similar thought processes in my head where I justify quitting and leaving the addiction, over and over again. The internal conversation is almost as surreal as seeing Osama Bin Laden being shaken down by Major Grubert from the Airtight Garage series. How Giraud relates all this to his creative process is fascinating. While not an easy read Inside Moebius is essential for anyone interested in the French artist Jean Giraud. We are still a long way away from the future of flying cars, cosmic mysticism and fantastic quests that Moebius envisioned. This book suggests that we all understand ourselves first before we get there.